2.4 Participation in the competition can only take place online using registered Twitter and facebook accounts and winners will only be selected from entries from accounts that follow @BANGShobiz. No applications to enter made in any other manner will be accepted. 2.6 By submitting a competition entry, you are agreeing to be bound by these terms and conditions. 2.7 The winner will be chosen by random number generator and will be contacted personally. Recourse by law is excluded. 2.8 BANG Media International reserve the right in its absolute discretion to disqualify any entrant if it has reasonable grounds to believe that an entrant has breached any of these terms and conditions. Each entrant acknowledges and agrees that any failure to comply with these terms and conditions could lead to BANG Media International disqualifying that person, without BANG Media International giving any reason for such disqualification or granting any opportunity for challenge. 2.9 In the event that a prize-winner is disqualified from the competition, BANG Media International will select an alternative prize-winner in the same manner as the original prize-winner and such selection will be subject to these terms and conditions. 3.1 The competition is only open to candidates aged 16+. It is deemed that the parent(s) or guardian(s) of any entrant that is aged under the age of 18 have consented to that person’s entry into the competition and these terms and conditions. Entrants may be required to provide proof of identity and if aged under 18, should be able to demonstrate to BANG Media International’s satisfaction that their parent/guardian has given their consent to such entry. is not eligible to enter the competition.BANG Media International reserves the right to disqualify any person that it knows is, or has reasonable grounds to believe is, ineligible for the competition as a result of this condition. 3.3 In entering the competition, you confirm that you are eligible to do so and eligible to claim the prize. BANG Media International may require you to provide proof that you are eligible to enter the competition. 3.5 There is a limit of one entry per person per competition. In the event that BANG Media International discovers or has reasonable grounds to believe that the same person has made multiple entries, such person and any entries made by them shall be disqualified and, if such entrant has already been selected as a prize-winner, an alternative prize-winner will be selected in accordance with condition 2.11. 3.6 BANG Media International reserves all rights to disqualify you if your conduct is contrary to the spirit or intention of the competition. 3.7 Competition entries cannot be returned. 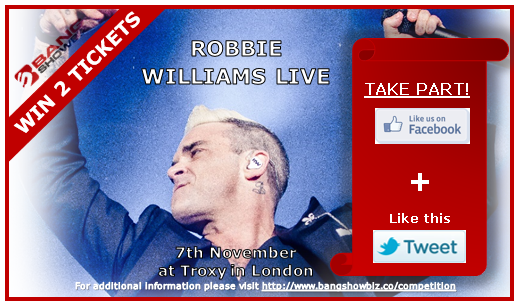 4.1 The prize are two free entry tickets for the Robbie Williams concert at November, 7th 2016 at Troxy in London. 4.2 There is no cash alternative for the prize. The prize is not negotiable or transferable. 4.3 In order to claim the prize you must comply with condition 6. The winner of each phase of the competition will be announced by personal message on the 1st November 2016 at 12:00. 6.1 If you are the winner of the prize, you will have 24 hours from the Announcement Date to claim the prize by following @BANGShowbiz and sending a direct message on Twitter to @BANGShobiz with your contact details, including your name, telephone number and email address. If you do not claim the prize by this date, your claim will become invalid. 6.2 The prize may not be claimed by a third party on your behalf. 6.3 BANG Media International will make all reasonable efforts to contact the winner. If the winner cannot be contacted or is not available, or has not claimed their prize within 2 days of the Announcement Date, BANG Media International reserves the right to offer the prize to the next eligible entrant selected from the correct entries that were received. 6.4 BANG Media International does not accept any responsibility if you are not able to take up the prize. Insofar as is permitted by law, BANG Media International, its agents or distributors will not in any circumstances be responsible or liable to compensate the winner or accept any liability for any loss, damage, disappointment, personal injury or death occurring as a result of any entrant entering this competition, taking up the prize, or as a result of any entrant winning or not winning any prize, except where it is caused by the negligence of BANG Media International, its agents or distributors or that of their employees. Your statutory rights are not affected. By entering the competition, you agree that any personal information provided by you with the competition entry may be held and used only by BANG Media International or their agents and suppliers to administer the competition. 10.1 If there is any reason to believe that there has been a breach of these terms and conditions, BANG Media International may, at its sole discretion, reserve the right to exclude you from participating in the competition. 10.3 BANG Media International reserves the right to hold void, suspend, cancel, or amend all or any part of the competition where it becomes necessary to do so. Any changes to these terms and conditions, or cancellation of the competition, will be posted on the company’s website. It is the responsibility of entrants to keep themselves informed as to any changes to the terms and conditions. 10.4 This competition is no way sponsored, endorsed or administered by Twitter or facebook.